Mondays are rough. Today was made even rougher than normal when I arrived at work turned on the computer and saw the terrible news about Las Vegas. Somehow I had made it to work without checking my phone at all, so when I saw the news I felt like I had been previously living in an ignorant bliss of the evil the world can sometimes be. It seems that with each mass shooting, we become more numb. How many of these will happen before people realize that this is a problem in America and that it needs to be fixed? I try to keep politics out of this space, but I really wonder when enough will be enough for our politicians. It scares me that events like this have become a norm in our society and I wish that more people in power acted like they cared about what is at stake. On a lighter note, events like this make me think about the important people in my life, all the things I want to do, and how I don't want to let events like this scare me from going out into the world and living. It will take time, but I hope that one day no one will have be concerned about an event like this happening. Maybe one day. Italian wedding cookies hold a very dear place in my heart! I've been eating them since I was a child, especially around the holiday season. Thinking about the almond-y cookies coated with white glaze and colored sprinkles transports me right back to that place. This past weekend for some reason I just started craving Italian wedding cookies so I whipped up a batch. 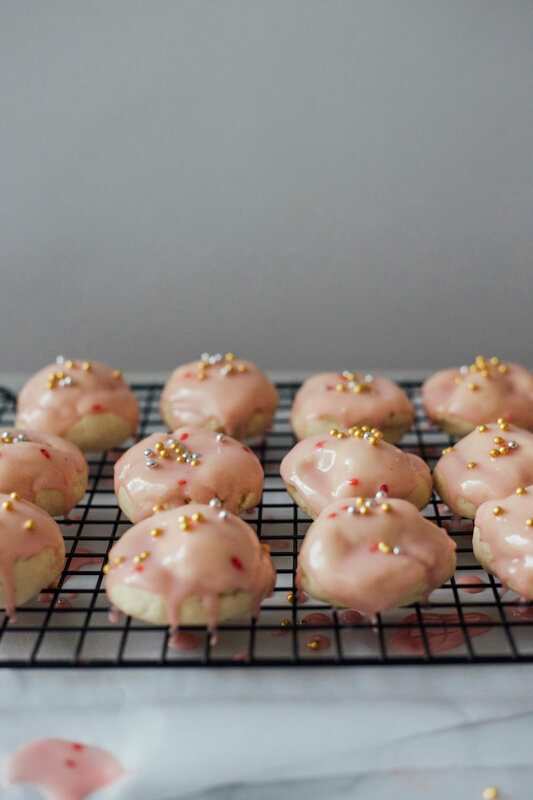 I tried to elevate them a bit by under baking them ever so slightly so they were moist and chewy, and then used a naturally dyed glaze (pink!!!) and gold sprinkles. Mix together flour, baking soda, salt and cinnamon in a small bowl and set aside. With an electric mixer, combine the eggs, sugar, butter, and extract for about 2 minutes until light and fluffy. In portions, add dry ingredients to wet ingredients until just mixed. With hands, roll the dough into balls and place onto a parchment lined baking sheet, about 1 inch apart and chill them in the refrigerator for at least an hour. When ready to bake it will be firm but still flexible. Preheat oven to 350 degrees F and bake for 10 to 12 minutes. In a small glass bowl, mash raspberries until soft and set aside. In a different bowl, sift confectioner's sugar. Add whole milk and dash of salt until combined. Using the back of a metal spoon, press raspberries so that juice comes out, and use the juice (it's okay if a couple seeds get in there!) and add into the sugar mixture. Add juice according to how pink you want it. I used about 2 teaspoons.